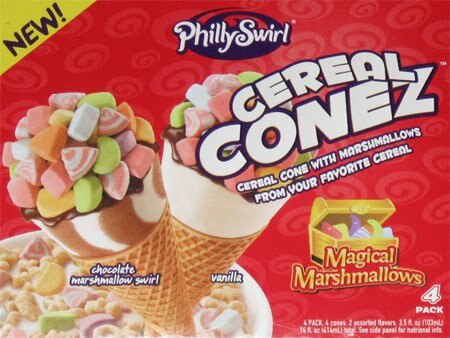 [Discontinued] I was pretty excited the week before last when I found the NEW PhillySwirl Cereal Conez. Sure they has an awful name, but I do love cereal, so how could I possibly resist? I mean, I've waited five long months since the impulsive buy's kayla first reviewed these and I couldn't wait to surprise my daughter with them last Saturday. So here we go: A 4 pack of "cereal cone(s) with marshmallows from your favorite cereal". 2 are chocolate marshmallow swirl and 2 are vanilla. Unfortunately both come in nondescript white wrappings BUT if you look closely, you can see through the paper and see which is swirl and which is vanilla. 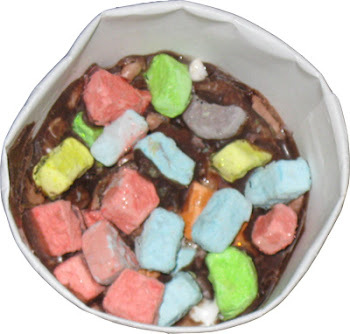 Wow, it certainly looks like lucky charms. They really are just piled on aren't they? Hmmm, I think I was more impressed with the top view. This side view looks a bit... Iunno... anti-climatic? 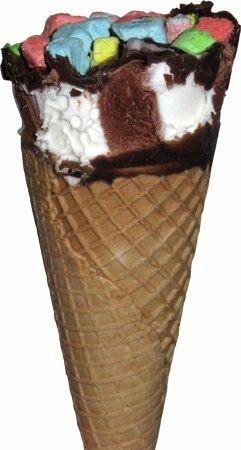 Well at least in general it looks like every other cone we've ever tried... so what could possibly go wrong? We start to dig in and the cereal bits are easy enough to eat. I guess I expected them to be a bit dried out, like before you pour your morning milk into the bowl, but instead they were very soft. In fact, there is zero resistance in the first few bites of cereal cone. The bits are soft. The sauce is soft. The ice cream is soft. There is no contrast here. Just senseless chewing... sorry, I'm old fashion. Drumsticks are crunchy. (most) Champs are crunchy. M&M cones are crunchy. Everything is crunchy.... except this. I need some kind of texture here but there is none. Problem is, things got much, much worse. Just how soggy is the cone? It's so bad, it actually unrolled!!! I'm sorry, but this kind of behavior from a cone is unforgivable. This is why I have deemed Cereal Conez an Epic Fail... A first on the blog really. I always make one simple request. I don't care how bad the ice cream is, you have to get the cone right first. No exceptions and No excuses. This cone isn't a little soggy, or just soggy in spots, the entire thing is a gigantic, soggy, chewy mess. We even went back in the next day to see if the vanilla ones were any better but they were just as bad. Awful, just awful. You can say it's a fluke... you can say it had a rough ride up from wherever it came from... but this is intolerable. And we are looking for the absolute 'best' ice cream, what do you suggest we try, brand-wise? It seems like Haagen-Dasz is the most loved, no? A soggy, stale cone? eww! Too bad they're gross, i was just gonna try these too. It's totally possible it was a fluke... a horrible, disgusting, unforgettable fluke. @Jerilyn: funny, I was just talking about this with some other bloggers. Textures aside, if you want a classic flavor, you go Haagen-Dasz. When you want something unique, you go with Ben & Jerry's.